When, in February, 2003, Meryl Streep was Oscar-nominated for her performance in Adaptation, she overtook1 Katherine Hepburn to become the most successful actress in Hollywood history: 13 nominations in 26 years (Hepburn took 48 over her 12). She was born Mary Louise Streep on the 22nd of June, 1949, in Summit, New Jersey. 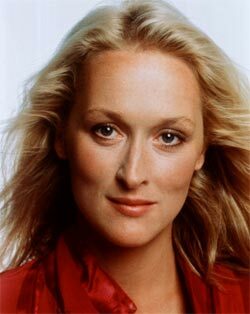 Her father, Harry Streep Jr, was an executive at a pharmaceutical company, while mother Mary was a commercial artist. Mary was 35 when she had Mary Louise, her first child. Young Mary Louise grew up in Summit, then the affluent2 New Jersey township of Bernardsville, a short distance west of Newark. Pointers to her later career (and level of professionalism) were evident3 from very early on. As a child, pretending to be her grandmother, she drew age-lines4 on her face and wore a sweater to “feel” more like her character. She made her stage debut in a school Christmas production, singing O Holy Night, and it was also telling that she delivered5 the song in perfect French, despite6 having studied the language for only a very short time. Indeed, singing was the girl’s first love and she dreamt of becoming an opera star. At Bernardsville High School, she was a fine student but, to begin with, an awkward7 teenager - gawky8 and lacking confidence9. Acting in school plays began to change this and, when at 15 she received a standing ovation for her part as the librarian in a production of The Music Man, she claimed she stopped feeling “dorky”10. Many other school roles would follow, including that of Daisy-Mae in Lil’ Abner. 1976 was a landmark11 year for Mary Louise (now calling herself Meryl). She proceeded to knock the critics out once more in the Shakespeare In The Park season, playing in Henry V and as Isabella in Measure For Measure. Meryl kept on the up. She starred on Broadway in the musical The Happy End, with John Lithgow in William Gillette’s Secret Service, and won an Obie for Alice In The Palace. She also made her screen debut in the TV movie The Deadliest Season, as the wife of Michael Moriarty, playing a pro hockey star who, pressured into becoming more aggressive during games, is charged with manslaughter12 when an opposing player dies on the ice. Schooled in the Sixties and Seventies, Streep was principled herself, demanding13 that both her roles and her performances be interesting and accurate. In 1978 she’d said “I’m looking forward to bigger parts in the future, but I’m not doing soft-core14 scripts where the character emerges in half-light, half-dressed”. She would very much bring these attitudes15 to bear on her next role, as Dustin Hoffman’s wife in Kramer vs Kramer. In playing the part, Meryl demanded that her role be re-written.). It was important, she thought, to explain why Joanna Kramer had left her family. It was so obviously a massive step for a woman to take, her reasons needed to be clarified16. The film was a huge hit, and gained her her first Oscar, as Best Supporting Actress. Naturally, she was delighted17, so delighted that during the celebration after the award ceremony, she left her precious18 statuette on top of a toilet. Many were surprised by Streep’s comic talents, and all the more so by her next film, Postcards From The Edge. It was another excellent performance, which saw her singing once more, but you couldn’t help feeling Streep would have been yet more impressive as the needy, overbearing23 mother. Nevertheless, she was Oscar-nominated again, and won an American Comedy Award. In spite of successful forays24 into comedy, Streep is considered a “serious” actress — talented, well-bred25, intelligent and a specialist in accents and dialects. Streep worked less and raised a family during the 1990s, but still turned in critically-acclaimed26 performances in television and film and racked up more nominations for The Bridges of Madison County (1995, opposite Clint Eastwood), One True Thing (1998, with William Hurt), Music From the Heart (1999), Adaptation (2002, starring Nicolas Cage), The Devil Wears Prada (2006, starring Anne Hathaway) and Doubt (2008, with Philip Seymour Hoffman). Considered by many movie reviewers to be the greatest living film actress, Meryl Streep has been nominated for the Academy Award an astonishing27 15 times, and has won it twice. She may not have reached the high-earning bracket28 inhabited by the likes of Julia Roberts and Cameron Diaz, but everyone recognises29 that a Meryl Streep movie will have something to say. It was quite right that she should, in 2000, have received France’s Order of Arts and Letters. She is, quite simply, the most brilliant30 actress of her time.